Ever since I went on the Dallas Contemporary bike tour of murals I have been paying attention to where more of these are. There are a lot more than you would think. 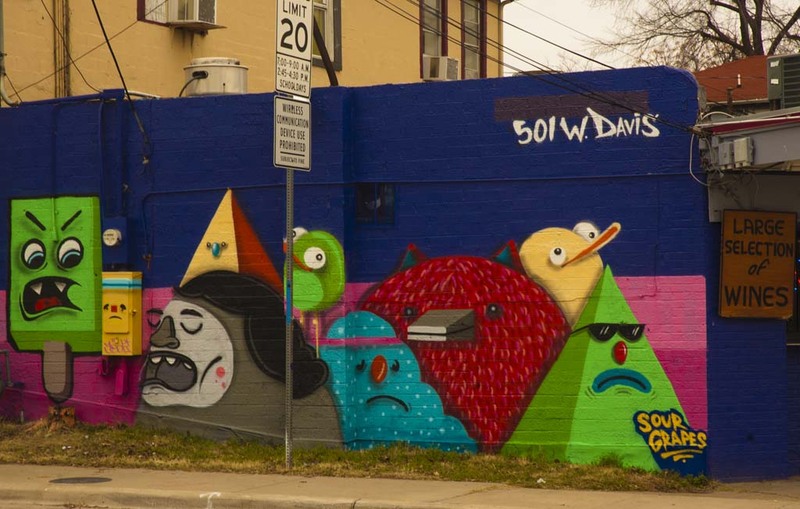 Today, I walked past another work by the local street artists, Sour Grapes. This one was on the side of a liquor store in Oak Cliff, near Bishop Arts – at 501 W. Davis. According to WordPress, this is the one thousandth entry in my blog. I’ve written a little over one blog a day, not missing a day, for almost three years now. This is the third or fourth blog I’ve done over the years – the first one, The Daily Epiphany, was the thirteenth (as best as I can tell) blog in the world, started in July 25, 1996. Of course, there weren’t any blogs in those days – we called them online journals. It was a lot of work back then – the entries were written in Notepad and all the HTML tags were written out by hand. Think of how much work it was to add new entries with back and forward links and tables of contents – all done without electronic help and uploaded by FTP. 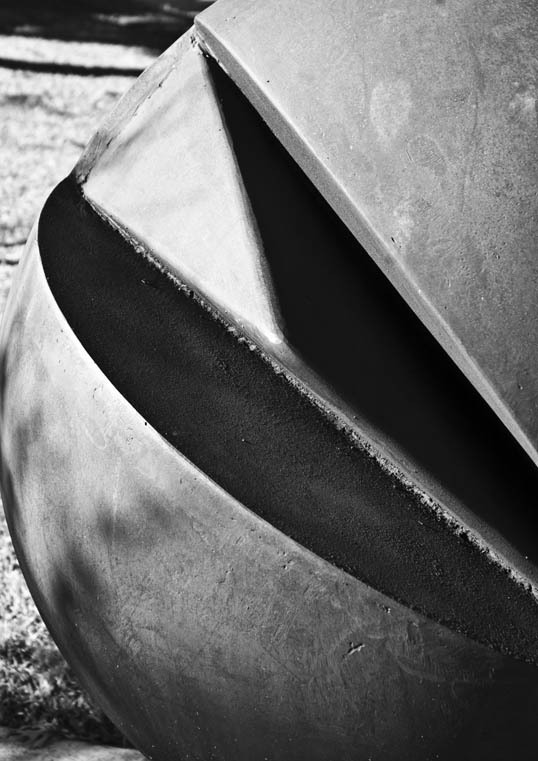 Within a year I had developed a series of Microsoft Word Templates with macros to help do all that – but it was a long way from today’s fully automated content systems. I wrote every day for seven years or so, until my kids grew old enough to read the thing and share it with their friends and I had to give it up. For a long time then, I switched to paper – looking to my left I see a stack of Moleskines I filled up in the years I would write every day in longhand. 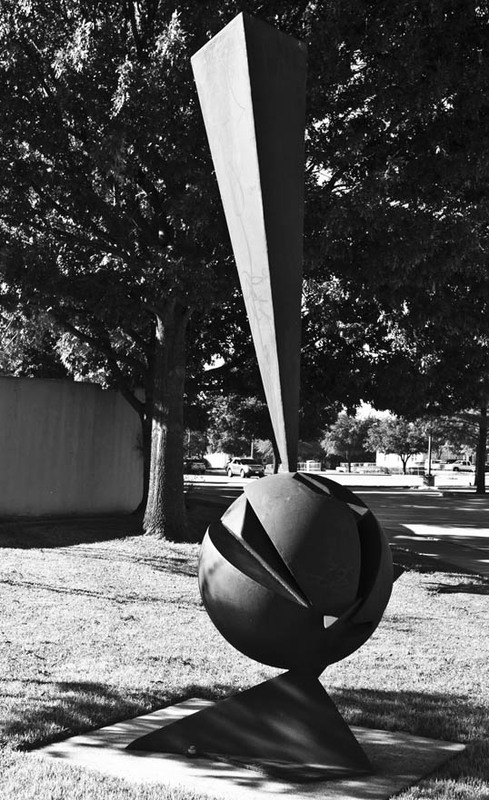 Finally, a friend of mine started a WordPress Blog and I thought it would be fun, so I cast my line in. Old habits die hard and I found that putting an entry up every day was important to me, even though I hadn’t intended to do this starting out. I don’t put much effort into the thing – most of my writing blood, sweat, and tears, nowadays goes into my pitiful attempts at fiction. I know I often only put up a single photograph… maybe a bilious quotation – but I have learned that if you are going to put something up every day you have to give yourself permission to sometimes do something easy. If you don’t like it, I’ll refund your money. 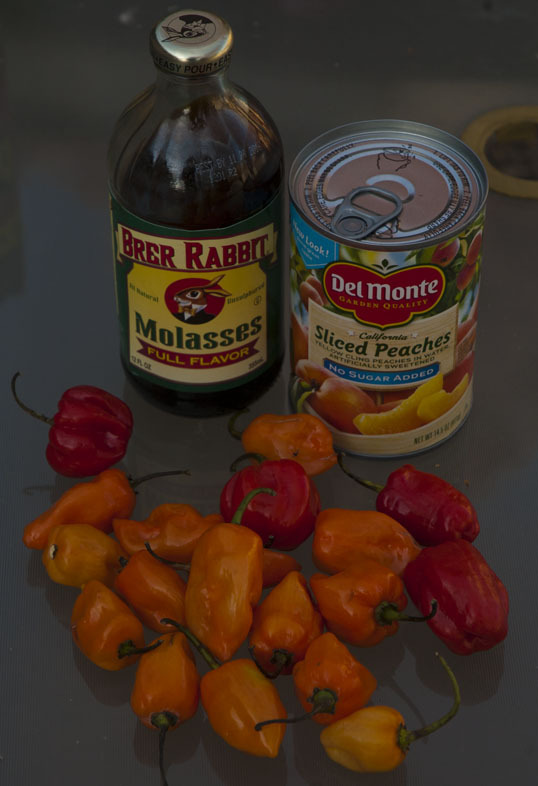 At any rate, a while back I came across a recipe for Habanero Hot Sauce on the Facebook page of a friend. Whirl it all up in a blender or food processor until it’s smooth. I poured mine into an old 12 oz Crystal hot sauce bottle I’d washed out. The ingredients sound a bit strange, but it works! A similar recipe I found also added 1/4 cup of molasses, but I didn’t have any in the house. I like hot sauce and this one looked good… so I bought a handful of red, round peppers and ground it all up. It tuned out very good… and very hot. 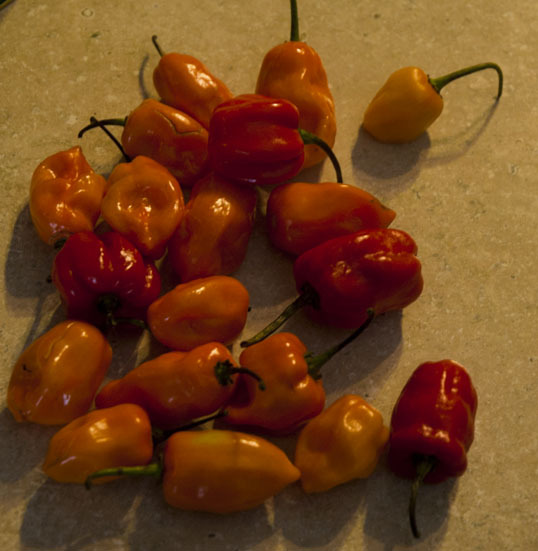 There is a lot of talk about bhut jolokia – Ghost Chilies and Trinidad Moruga Scorpion and such – but let’s face it – habaneros are pretty damn hot and they are readily available. I still have wonderful memories of fresh grilled seafood served with an Habanero paste that I had on Passion Island off of Cozumel – the best meal of my life. When I first tried the sauce my lips were swollen, my face burned, and the top of my head was drenched with sweat. When I tried the same dose a couple days later, it wasn’t nearly as toxic. At first, I thought it was losing its punch – but I realized that I was quickly developing a resistance. I began plotting meals that I could use to eat a little (only a little) of the sauce. 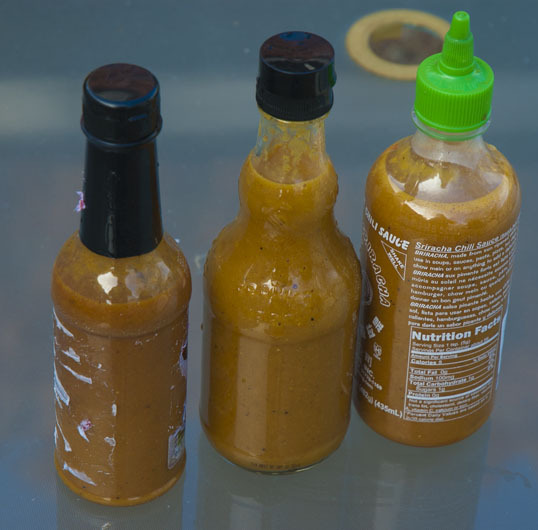 When my two sons came home for the holidays, the remaining sauce quickly disappeared and I knew I had to kick up the production and at least triple the batch sizes. I had to go to work for a while today and on the way home stopped off at the local Fiesta Mart for a bag of habaneros. 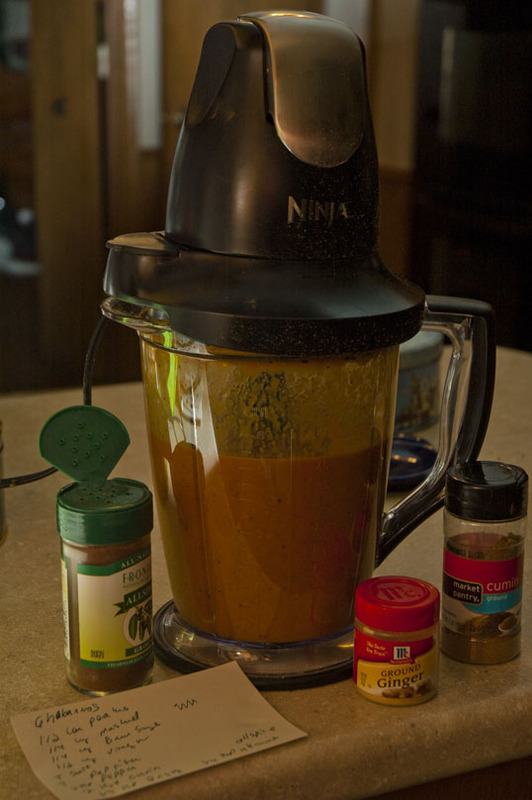 Recently, Candy bought a Ninja Master Prep food processor – Hey… just because it’s on TV doesn’t mean it doesn’t work – and it’s perfect for the dangerous task of chopping up the toxic peppers. My first batch had the seeds in it, which tended to stop up the dispensing apparatus, so I thought about cleaning the peppers first – but that’s a tricky proposition, so I simply screened the seeds out afterward. This batch came out even hotter than the first – but pretty darn flavorful. I have a feeling I might be making more of this stuff in the future. Funny, they don’t look that hot. Final product – filtered into re-purposed containers. I was driving to New Orleans, moving down Interstate 49, south of Alexandria. My plan was to get on Interstate 10 in Lafayette and then go east over the Atchafalaya to Baton Rouge and on into New Orleans. But I decided to take a look at my GPS and saw the I10 highway marked in a solid bright red line all the way from Lafayette to Baton Rouge. If you have never driven that stretch – and you will remember it if you did – that’s an almost twenty mile long bridge high up in the air over the most desolate scary swamp, the Atchafalaya River Basin, that you will ever see. It is not the place you want to spend a few hours stuck in bumper to bumper traffic as the sun sets. My GPS showed an alternate, older route – US190 splitting off east at Opelousas and going through a more northern section of swamp to Baton Rouge. The GPS showed that route as yellow and green. As I approached the turnoff a sign promised “Alternate Route.” That was all the encouragement I needed and I drove that way. It was a good choice. Under normal conditions it would have been slower than the uninterrupted expanse of fast concrete belonging to the I10 bridge – but today it wasn’t jammed with stopped vehicles. I only had to wait through the shorter delays caused by stoplights, fish camps, sugarcane factories, bait shops, fireworks stands, fried fish restaurants, local casinos… and the other flotsam and jetsam of the Louisiana backlands. 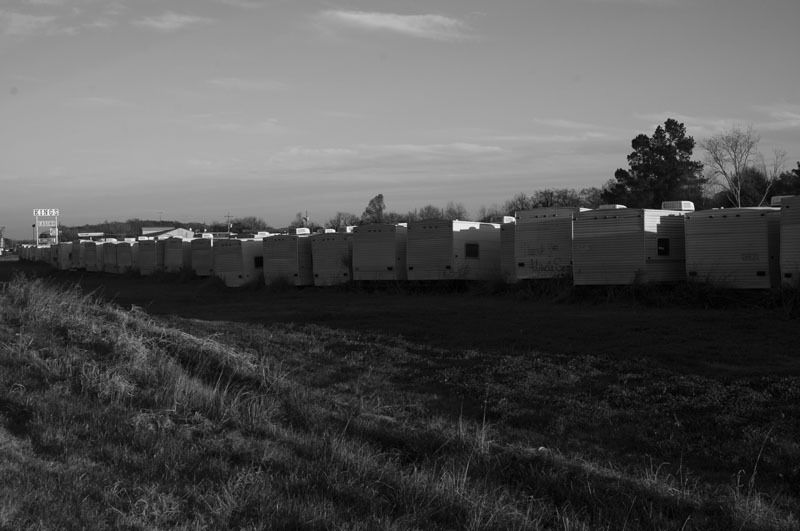 One thing that did catch my eye was a huge field, just east of Opalousas filled with thousands of mouldering empty portable housing units. 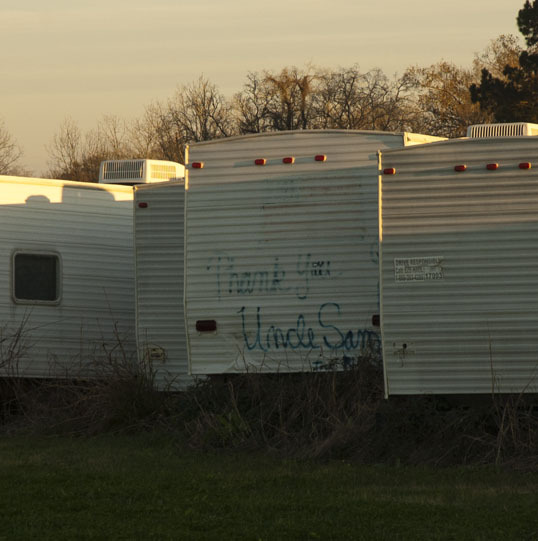 FEMA trailers. 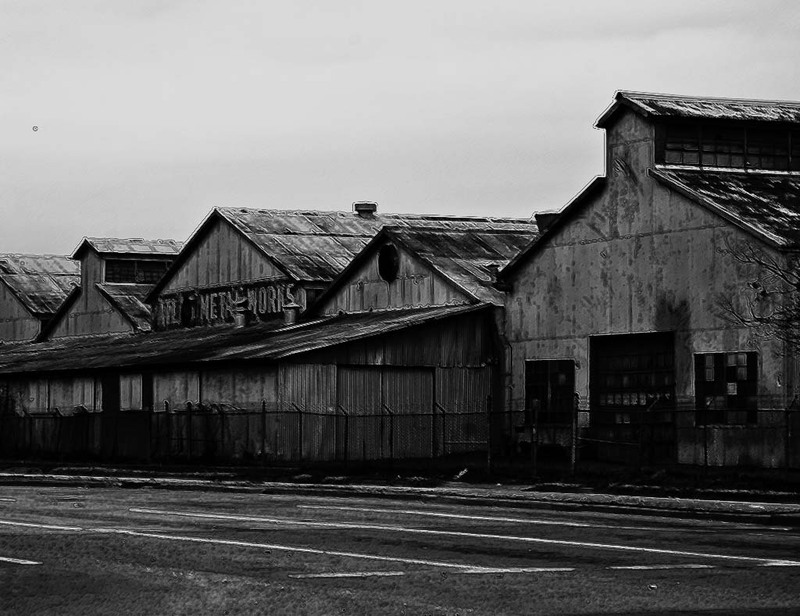 There were once hundreds of thousands of these left over after Katrina. Cheaply made, even by government standards, spewing formaldehyde vapors, leaking and harboring black mold – they were a controversial response to the disaster – sometimes welcomed, often maligned. But here they still are, eight years later. Come on down and buy one, they are for sale, pennies on the dollar. What a bargain. I drove to the Big Easy over the weekend to pick up my son Lee (who just graduated from Tulane) and bring him back to Dallas for the holidays. Since I had plenty of room in the car I removed the wheels from my commuter bike and packed it in. 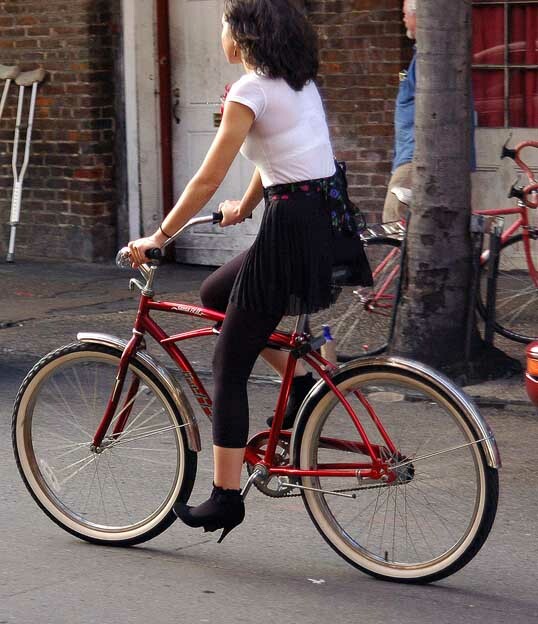 I have always wanted to ride a bicycle in New Orleans and never have. The French Quarter especially is full of folks on bikes (both natives for transportation and tourist rentals for entertainment) and I have always enjoyed hanging outside and watching folks ride by. 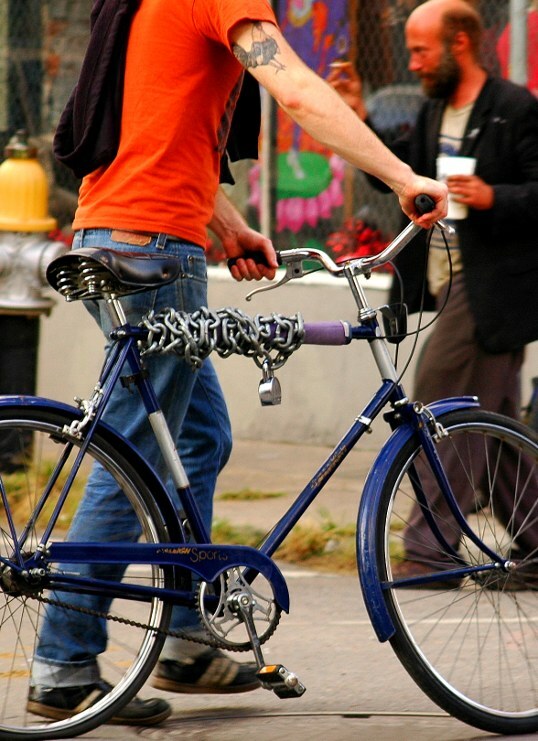 My son lives out by the university and I thought I might ride through the Garden District down to the quarter and back – it would make for a nice long day with plenty of cool places to stop along the way. He was working Sunday and I would have time to myself. Unfortunately, the weather did not cooperate. When I arrived the city was unbearably hot and humid and on the day I had planned on riding a cold front blew in and brought a powerful set of thunderstorms with it. 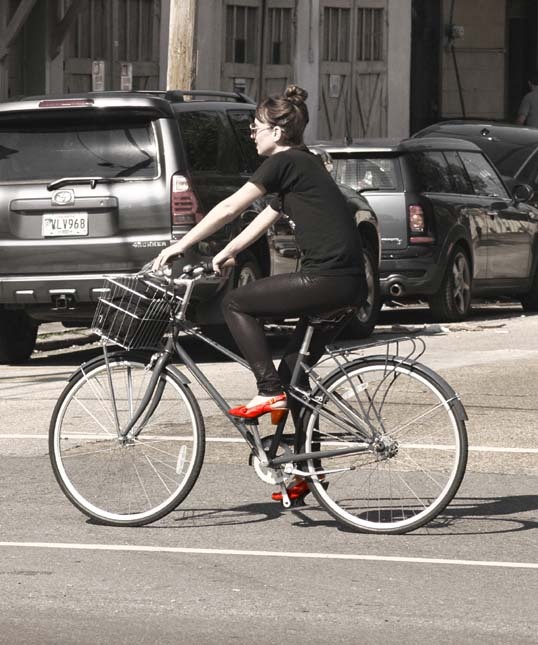 My commuter bike is set up with fenders and I have rain gear – but this was too much. A good rule of thumb is that when the lightning is so violent the thunder is setting off all the car alarms in the neighborhood every few seconds – it’s storming too much to go out. This went on all day. When it would lighten up a bit I would think about venturing out – but another band would blow onshore and the skies would open up with a drenching downpour and howling winds. I ended up staying inside all day. We were going to drive back to Dallas the next day, but he had some things he had to do in the morning so we couldn’t leave early. That gave me time to get in a quick little ride before we left. 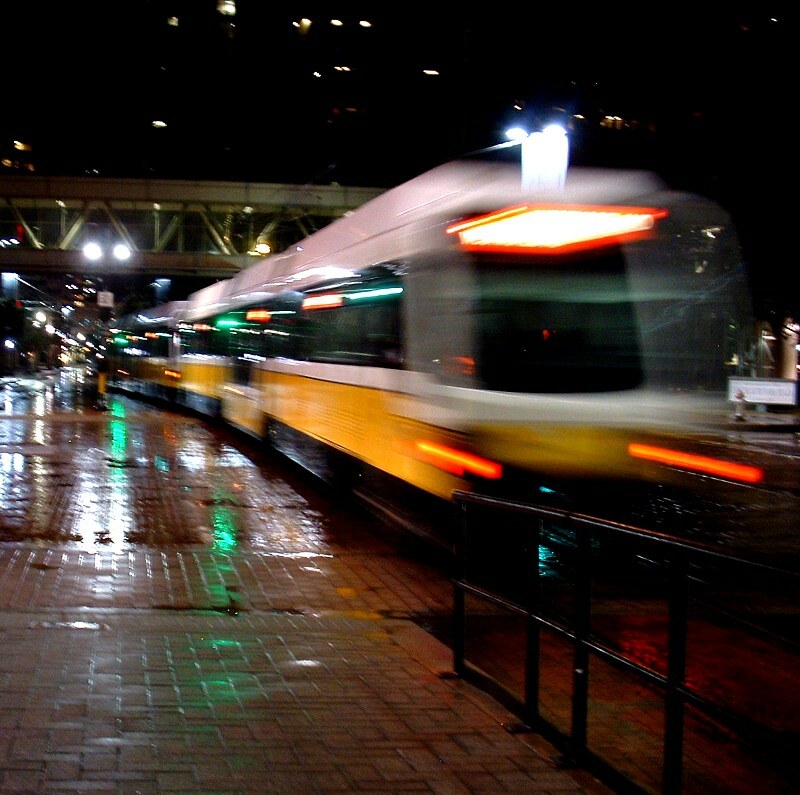 It was still very cold (for New Orleans), wet, and windy – but bearable, so I headed out. I rode through the Tulane campus, now empty for the holidays, and up St. Charles for a bit (they have a bike lane along some of the street). St. Charles in New Orleans is the most beautiful street in the world (in my opinion) though the traffic is pretty nasty for a bicycle. 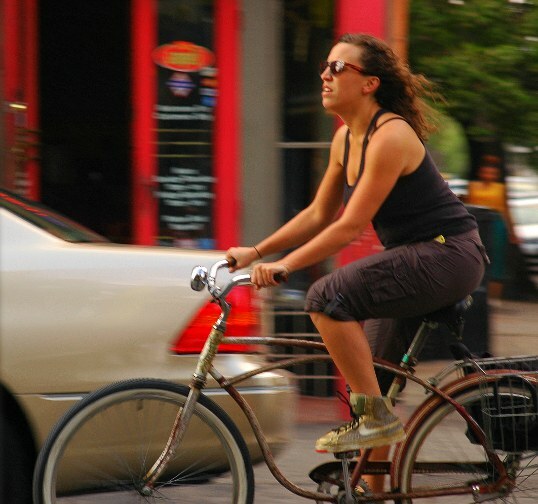 The city has sharrows painted on Nashville so I chose that route down to Magazine Street and rode there for a bit looking at the shops and restaurants before heading over to Audubon Park and circled the zoo down to the Mississippi. 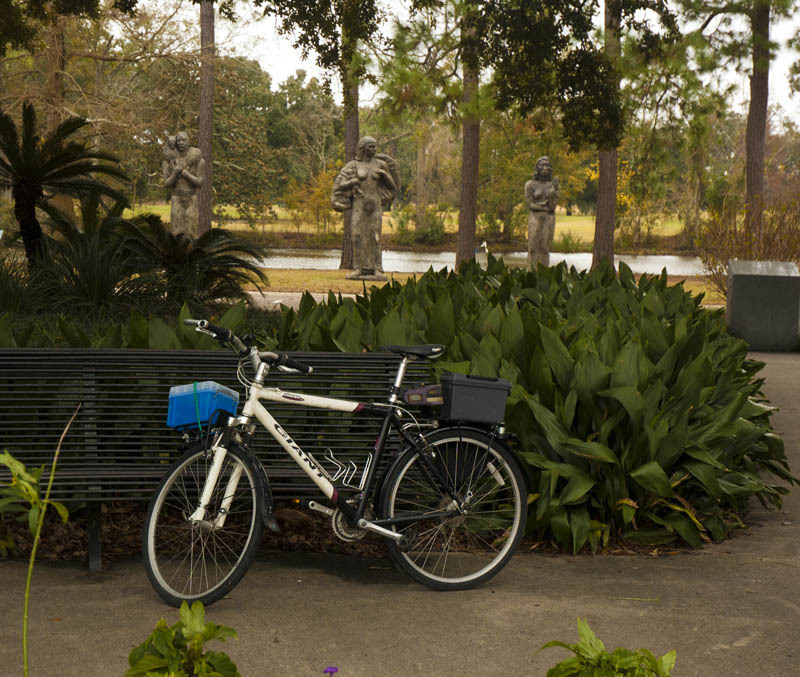 I rode back through the park and the Tulane campus then took a side trip down Freret to cruise through a nice up-and-coming area of shops and restaurants. That’s about it. It was fun, glad to get it in. Lee warned me the streets were rough and he was right. I’m glad I have a front shock on my commuter bike – the ride was through a constant series of cracks and potholes. 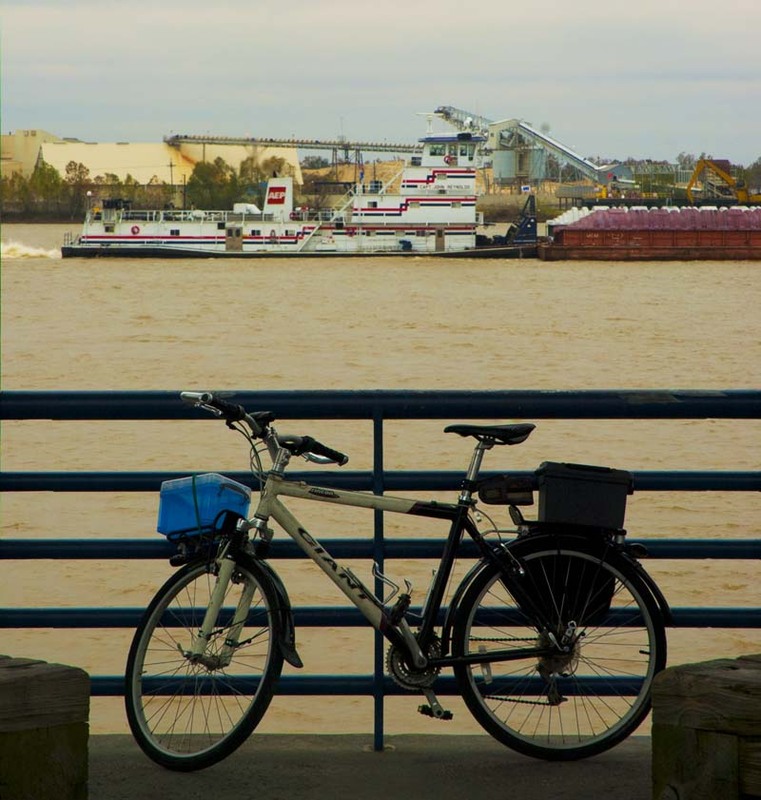 As I rode toward the river I thought to myself that it would be uphill coming back – in Dallas the streets slope surprisingly steeply down to the Trinity River – but in New Orleans it isn’t true, of course. That city is about as flat a cycling route you will ever see. The traffic there is nasty, of course. I’m sure you could get used to it – but it’s pretty tough, even compared to Dallas, which is well known as the least cycle-friendly city. The key is to learn your town, your neighborhood, and your routes – which can’t be done in one cold and blustery morning. Now I need to go back when the weather is better and do a bit more exploring.